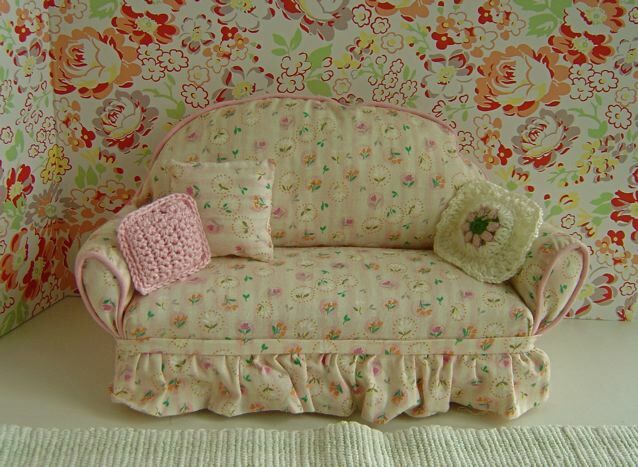 SOFA, WING CHAIR, AND OTTOMAN: Vintage, hand made pieces, incredibly squishy and cosy, and covered in a pale pink floral print. 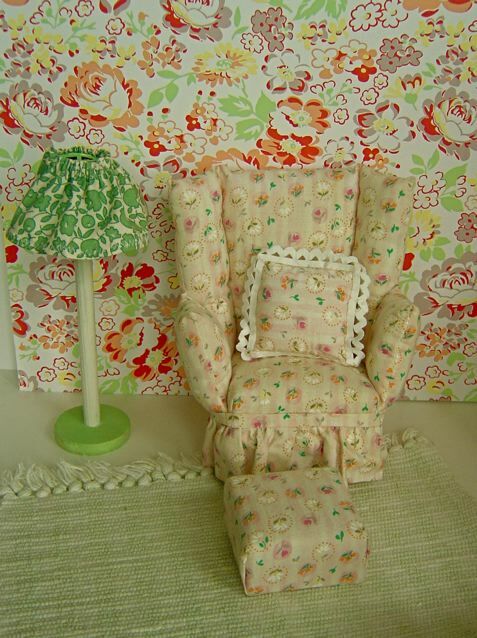 The sofa and chair have two matching pillows, plus two, charming, hand-crocheted ones. 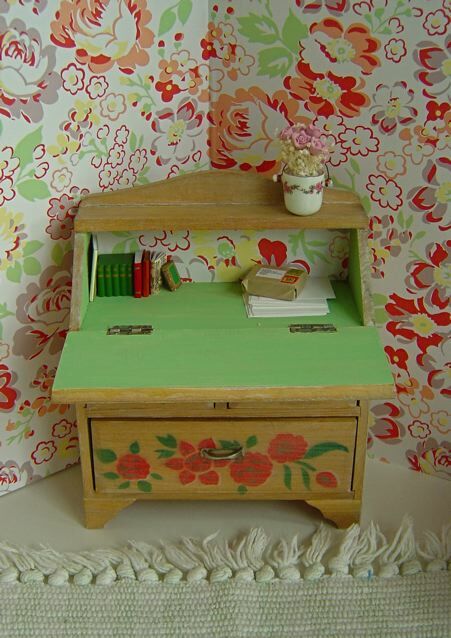 DESK: Charming stencilled piece, marked as made in Japan, which dates it from the 1950's-1960's. The desk features soft red stencilled flowers and green leaves on its exterior, but when the writing surface is opened up, it's even more wonderful - there's a painted and papered interior plus stacks of books and papers. There's also two opening drawers below, while a ceramic vase holds pink flowers on the desktop. LAMP: A handmade lamp with wooden base and gathered, vintage fabric lampshade. 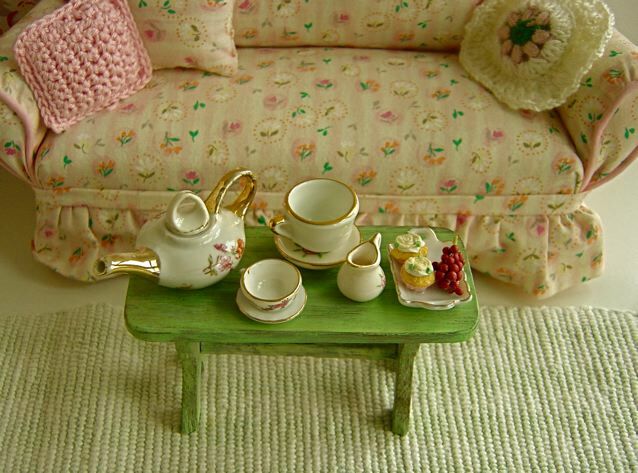 TEA TABLE: Vintage wooden table, painted pale mint green and set for tea, for two, with a selection of delightfully, mismatched, pink-flowered ceramic china. Please see the close-up of this little table, and note the two delicious-looking cakes! 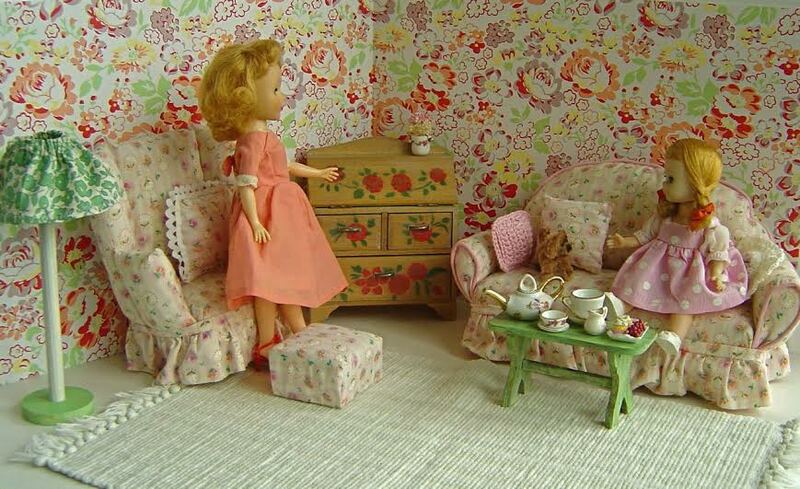 The little dog, who has his eyes on the cakes,comes with this room set. RUG: Palest mint and off-white woven cotton fabric with thick fringing at each end. WALLS: Covered in retro-inspired, modern wrapping paper, which has been mounted on two A3 pieces of 5mm thick foam board. Each piece of foam board measures 42 x 29.5cm or 11 5/8 x 16 3/8in. Dolls: Chosen from our selection of vintage dolls - on the left, a strawberry-blonde Toni doll, in a beautiful, handmade vintage dress and on the right, a blonde Madame Alexander doll; both dolls are available from the DOLLS section of this website. Note that there are lots of other clothes available for these dolls – please see the CLOTHING section of our website for an idea of what is available.